Come learn about the 4J Vision 20/20 strategic plan–our roadmap for the future! Parents, students, staff and community members are invited to meet with 4J Superintendent Dr. Gustavo Balderas and learn about the 4J Vision 20/20 strategic plan on Tuesday, Nov. 14, at 6 p.m.
Eugene School District 4J is looking to the future with the 4J Vision 20/20 strategic plan, which was developed in partnership with the community and adopted earlier this year by the school board. The plan is a roadmap to guide the school district’s efforts and resources for the next three to five years. At this community meeting, 4J Superintendent Dr. Gustavo Balderas will share and discuss the 4J Vision 20/20 strategic plan and the efforts underway in our school district to meet its goals. 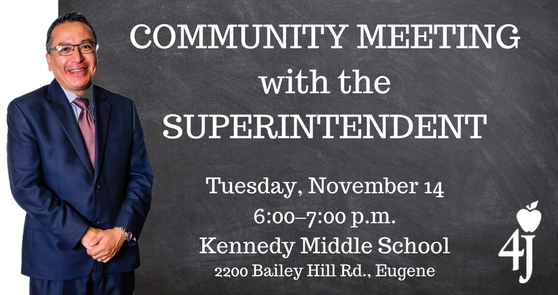 Tuesday, November 14, 6–7 p.m.
Kennedy Middle School, 2200 Bailey Hill Rd. Vision: Every Student Connected to Community and Empowered to Succeed. Learn more about 4J Vision 20/20 Strategic Plan. Additional community meetings with the superintendent on different topics will be held throughout the school year.